Create custom shipping rules based on a variety of product conditions and shopping cart attributes. Apply additional delivery options surcharge, discount or replace shipping rates according to your business needs. Create unlimited number of rules. you'll be logged in automatically. See how the rule 'Surcharge $50 for Alaska' works. Select the priority of rules application for products that fit conditions of several rules. Sometimes you may need to increase, decrease or just change shipping rates preset by carriers. The module provides all necessary functionality to do that. So for example using this module for Magento 2 UPS shipping cost can be altered from $10 to $15 or get down to $2 if you want to create a discount. It is possible to modify delivery prices both by flat amount and by a certain percent at the same time. Furthermore, you can select a base amount for the whole order. For example, in certain situations you can add $25 surcharge for the whole order and $5 + 10% of the product price for each individual product. Or no discount for the whole order, however 5% of product price off shipping for each individual item. Model delivery prices based on order attributes like subtotal, items in cart or weight. Product attributes such as SKU, brand or color can also be treated as conditions. Moreover, you can choose address options like country, state or ZIP-code to define the rule. For example you can provide a shipping discount for orders to California with subtotal greater than $200 that include any ‘Sony’ product. You can have separate shipping rules for each store view and customer group. This feature is designed to help you offering better shipping rates to your premium customers. It's possible to create rules for as many groups as you need. Keep in mind that pricey shipping is often an important reason for clients to abandon purchases. Adjust shipping to boost sales! Efficiently manage shipping by arranging separate destinations into areas. Make each area highly detailed: you can include or exclude particular countries, states, regions, cities, zip codes, etc. Check a use case: you deliver goods to distant regions and want to add a surcharge to regular shipping rates. With the extension, you can create an appropriate shipping area that includes the necessary regions. 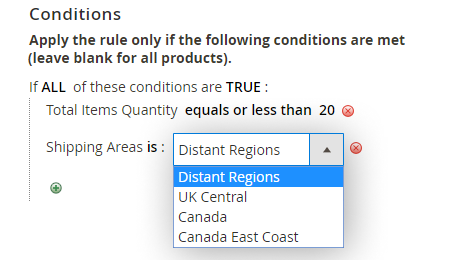 Then, you'll be able to apply rules to all these regions at a time via the created shipping area. Explore how to use custom checkout fields to collect comprehensive order data with regard to a selected shipping method. Extend Magento 2 shipping functionality with our new package solution: 3-in-1 Shipping Suite. I started working with this module about 3 mths ago and can say it’s a must have but for me was hard to understand some specifics of setting up the rules. First I called to support nonstop they always configured. Then I tried to enable conditions myself and checked everything with user guide. It was inconvenient because I had to switch between pages and I always mixed things up. But about a month ago they added inf hints and now I don’t ramble around the store just check what I need in the admin. A good extension that is easy to set up and use. Nov release brought some long-awaited (at least by me) updates. They added customer shopping history in conditions, which allowed me to reward clients for their loyalty by giving them better rates. Also, now the module works better with promotions. If you use coupons or special offers on certain days, you can easily disable rules. First, we wanted to use shipping table rates but after reading about other modules and talking to amasty support we decided to go with shipping restrictions and shipping rules. If you also need to limit shipping of certain items in certain ways, this is a more convenient way of doing it than using table rates, as we first wanted. Amasty explained to us how to configure table rates for this purpose but it would have taken too much effort, so we decided to switch to this module. The module is easy to use and has many features. As I said, the support team is always ready to help. So, would I recommend it? Definitely, yes. A great plugin to create advanced and flexible shipping rules. We had a little issue with one rule configuration, but support team corrected the mistake in 24 hours, so it was fine) Thank you! – Fix: the issue with Category selector in rules configuration was fixed. – The issue when multiple rules were not applied at the same time was fixed.